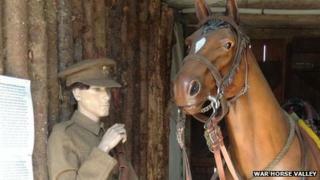 A Devon farm which featured in the children's book War Horse has opened a museum dedicated to the story. Parsonage Farm, which has been farmed by the same family for nearly 100 years features in the Michael Morpurgo book, along with the parish of Iddesleigh. The farm's 500-year-old cob barn now houses a War Horse exhibition, along with World War One artefacts. Local residents have contributed letters and photos from 100 years ago to the exhibition. Graham Ward, from the museum, said: "Michael Morpurgo is a neighbour and he based his book on this farm. "He has lived here since 1974, Iddesleigh is his home. There are several people that Michael spoke to when he was writing his book. "We've had several people come to the village through the book and the film." In the book, which has been turned into a film and stage play, the main character Joey the horse grows up at the Wards' family farm. Several fields mentioned in the story belong to the farm. The museum also looks at farming in Devon, 100 years ago, showing off a variety of machinery. Mr Ward said: "Life would have been hard work, lots of manual work. People worked together in large numbers. "To milk one cow would take about a quarter of an hour manually, now with machinery we can milk 14 cows in 10 minutes." The farm was also once home to the Reverend John "Jack" Russell, the first breeder of the terriers to which he gives his name. The new museum, called War Horse Valley Country Farm Park, opens to the public each weekend from Easter until the end of September.